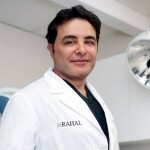 You are here: Home / Hair Loss Blog / Ask Dr. Rahal / What's the Difference Between FUE vs FUT? I am 29 with hair loss, and I like to keep my hair short. At this point I can’t hide my receding hairline any longer. So I am considering hair transplant surgery. Can you explain the difference between fue vs fut? With FUT, also known as a follicular unit transplant or strip, you are given local anesthesia in the donor area of your scalp. A donor strip is then remove and the area is sutured. 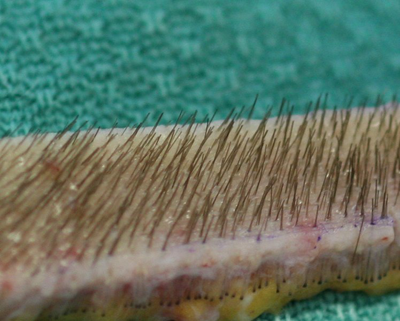 This typically leaves a fine scar that’s easily hidden by your remaining hair. The follicular units are then divided under microscopic control into natural groupings of one, two and three hair follicular units. With FUT, the donor strip is divided under microscopic control into natural groupings of one, two and three hair follicular units. With FUE, we still utilize the follicular unit approach to hair restoration, but instead of removing a donor strip, we remove one individual follicular unit at a time. The instrumentation we use is so small that the donor area is left with tiny, almost invisible marks. You can watch a FUE video here.. 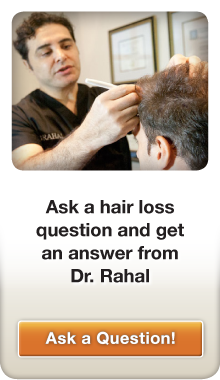 The main advantage to FUE is that it provides flexibility to have a short hairstyle. FUE is also a good option for those who do not have enough scalp laxity to undergo traditional strip excision and can even be used to repair donor scars from previous strip procedures that cannot be excised. Other advantages include minimal discomfort after surgery and less downtime. I am 27 years old and I am considering FUT but wanted to know a little more about FUE. Is there any long term post-op results with FUE? How many patients have you performed this surgery on? Our first FUE session was performed in 2005 (smaller sessions only). In 2010, we incorporated FUE full-time into our practice. We now routinely perform large FUE sessions of up to 2,500 grafts. Roughly 100 patients a year request FUE for various reasons (see advantages above). Most of our patients still prefer FUT however, mainly because it’s more cost effective and can cover a larger balding area per session. 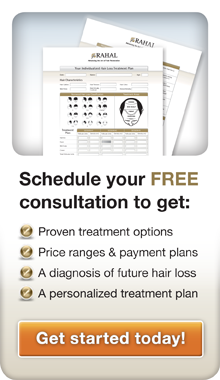 I suggest that you schedule a free consultation to meet a patient in person. It’s also possible to speak to fue patients over the phone if you wish. Please contact our office at 1-877-712-4247. Best of luck.